If you have already earned Certification, scroll down to request your certificate and patches. What does it mean to get your appliance repair certification from MST? Many customers like to see that a repairman is “certified,” but they essentially never ask where the appliance repair certification comes from. Since there is no universally-recognized standard certification in the US for appliance repair professionals, it’s up to you to choose the best place to get your Certification. 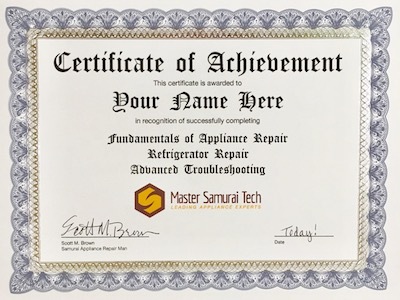 Master Samurai Tech has an excellent reputation for training excellence in the appliance repair industry. The Mr. Appliance® franchise organization and Sub-Zero Group, Inc. have both chosen MST to provide online technical training for their tech communities. We have provided training classes at national and regional training events for the United Servicers Association. Many multi-tech businesses use MST Academy to train their crews, and hundreds of individual owner-operators have taken our courses to begin or boost their business. Earning Appliance Repair Certification at the MST Academy demonstrates a commitment to your profession and an unparalleled depth of knowledge. If you are wanting to impress an employer, this will do it. If you own your own business and simply need to impress your customers - you will. How is MST Certification different from others? Most certifications are based on simply passing a single exam. Master Samurai Tech's appliance repair certification shows that you passed dozens of quizzes and exams while receiving a structured and rigorous education in the essential knowledge and skills of the modern appliance technician. In fact, the MST Academy is more like a certificate program, a growing trend in higher education for both acquiring and demonstrating skills, which typically indicates completion of a course or series of courses with a specific focus along with some kind of assessment that must be passed. Many people ask us about EPA Certification, which is required for techs who will be working with refrigerant. EPA certification simply shows that you’ve passed a test regarding refrigerant handling and understand the regulations and certain safety procedures. It does not demonstrate your technical competence or ability to troubleshoot and repair sealed systems. Note that the requirements are for each quiz or exam, not based on an average. If you have completed our technical courses and achieved the target scores required for certification, then show your accomplishment off to the world with a fine certificate, signed by the Samurai himself and mailed to you. Simply submit this form to us and we'll get 'er done. PATCHES: If you want to order patches for your uniform shirt, click here. If you are enrolled in a course bundle, then please wait until you have completed all of your courses before submitting this form! You must be enrolled in one or more of our technical courses and logged in to the site to request a certificate!